ondon is already a boiling cauldron of commuting hell. It’s a balmy 22°c. Sticky commuters pour out of Borough tube station like angry ants. Those who’ve committed to cram themselves into air-con-less buses, are fanning themselves with bits of paper, iPads… anything, to keep cool. Stationary cars stack up nose-to-tail at Borough crossroads. Heads down like zombies, drivers stare blankly at their phones, checking facebook, emails and texts, waiting for the lights to turn. They look up to see green for a few glorious seconds, the lucky few break for freedom and shuffle past to the queue on the other side of the road. To complete their misery, these weary travellers were up at silly o’clock, to make their way into London, to beat the queues, to get to work for nine. But not me. I’ve got a motorcycle. It’s also 8am, but I’ve just finished a leisurely breakfast and filling up the Honda’s 16.7-litre fuel tank at the Esso services in Cobham. It’s here where the M2 motorway from the coast terminates and the A2 takes over. The tarmac sprawls-out into the three lanes, ready to transport you to the Big Smoke. I’m 24 miles away from Borough underground station – a typical journey to work from commuter-beltville into London, or any major city or town. But this journey is one of the busiest in the UK, especially on a Monday morning. Most choose to take trains and buses, or drive a car, but anyone who’s tried either will know that journey gets harder every year. Traffic gets heavier and public transport is ever busier and more expensive. 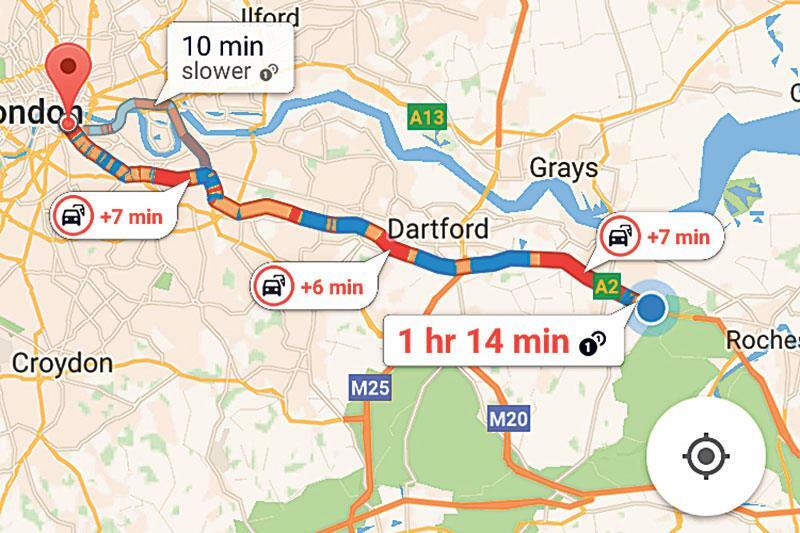 Checking the map app on my phone the A2 into London is a riot of angry red lines. Traffic’s at a standstill for lots of the way and it’s already gridlocked here next to the petrol station. It predicts a journey time of one hour 14 minutes, but I reckon I can beat that time on a bike with a bit of nifty filtering through the rush hour melee. This isn’t just any old bike, it’s Honda’s new CBR500R – the revised version of the MCN’s group test-winning A2 licence-compliant machine. It’s easy to ride, handles beautifully and always surprises with its speed, despite making a modest 47bhp, from its bulletproof, liquid-cooled 471cc parallel twin-cylinder engine. For 2016 changes are minimal, but useful. The Honda now comes with an adjustable front brake lever, to suit all hands large or small, smoother-action, preload-adjustable forks, improved airflow to the airbox, a new exhaust, a hinged fuel cap and sharp new styling. 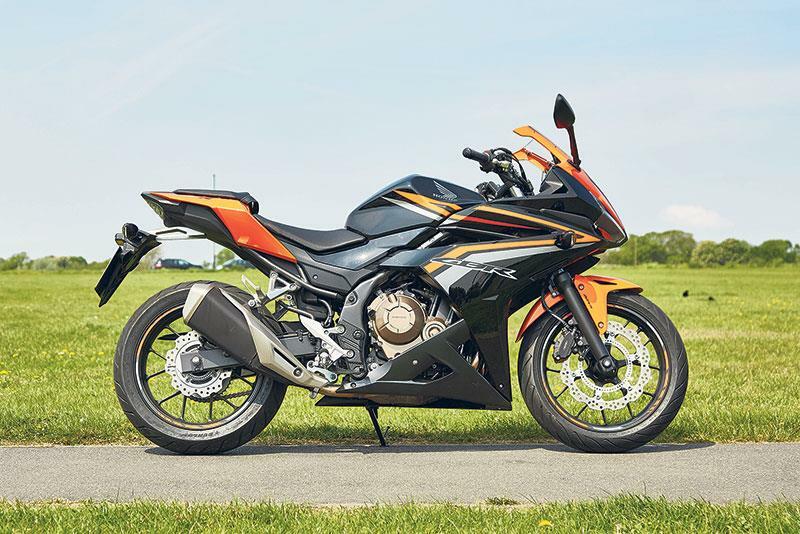 Build quality is superb, the CBR’s paint finish is excellent and there are lots of nice detail touches, like the RCV strakes on the tail unit, aggressive nose and LED headlights. It’s a class act. All of these changes add up to a machine that’s even slicker and more capable, but I’ll let you into a secret. If you can only stretch to a use d CBR500R don’t worry, it’s just as good and there’s also no need to chop your old one in for new. If you’re in a car, van, truck, coach or bus, this part of the A2 is an exasperating 21-mile stretch of dual carriageway. It snakes past the M25 turn-off, through Bexley and on to the ‘Sun in the Sands’ roundabout near Blackheath. 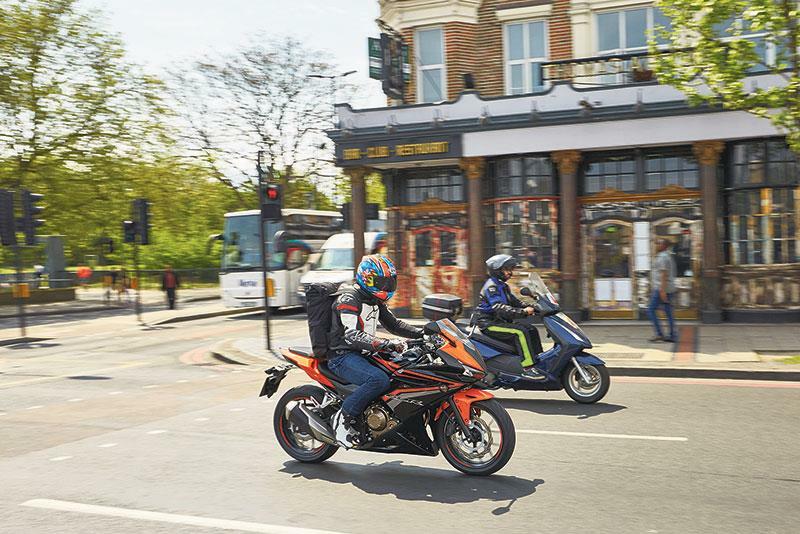 For no apparent reason at rush hour it goes from free-flowing, where the CBR500R will happily purr along at 70mph, to a complete standstill, where the Honda filters mellifluously through the sticky jams. Sitting in this traffic, day-in-day out, would send me crazy. Blackheath is where the misery really begins, if you’re not on two wheels. Now the A2 shrinks into single carriageway mayhem. It’s only three miles from here to Borough – just over the water from the city, but it would seem like longer, crawling along at 5mph in a car. 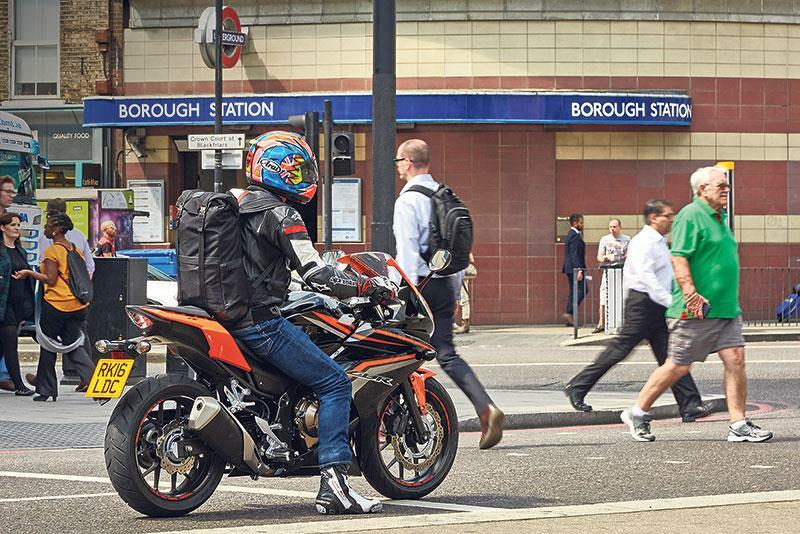 I used to do this commute in the late 80s when I was 18, riding my GSX-R750J to South Bank University. It used to be a polytechnic (remember those?) and back in the day there was a bus station opposite, which, just my luck, turned into the Ministry of Sound just after I left. Back then I used to race the couriers through the snarling queues on my Slingshot and dart the wrong way around Keep Left bollards. Every traffic light was the start of an imaginary 500cc GP race. I’d pretend I was my hero Kevin Schwantz and wheelie off the line, ahead of couriers on their CX500s and NTV650s. Nearly three decades later I’m older, wiser and happily let bikes overtake. Sitting pretty on the Honda I now ride in their wake when they split the traffic like two-wheeled battering rams. You can tell the experienced ones who do this journey every day. Like I used to, but have forgotten now, they know the best sides to filter without getting stuck and the all-important traffic light sequences. I’m in first with the CBR’s light-action clutch pulled in, anxiously waiting for the lights to turn, but they sit coolly in neutral. The lights flicker amber, they snick first, drop the clutch and get the holeshot. Steaming through New Cross, skirting the edge of Peckham and on to Southwark my commute goes in a flash. It’s exhilarating. Zip through traffic, chart a course around stationary buses. Bikes overtake and I overtake back, like some wild, urban club race. The further into central London I get, the more bikes there are – everything from scooters to Harley, Tracers, GS Adventures and everything inbetween. It’s great to see. The CBR500R is nimble, punchy and the throttle response is smooth. The controls are light and the dash easy to read. The single disc front brake set-up is strong, progressive and comes with the safety of ABS. The gearbox is smooth and there’s no massive clonk from neutral to first when you pull away from the traffic light GP. Mirrors give a great view of the misery behind and seem too far apart for small gaps, but they never get scraped. By the time I get to Borough tube station it’s taken me just 35 minutes to complete this 24-mile stretch of the A2. That’s less than half the time my phone predicted it would in a car and god knows how much quicker by inconvenient, clumsy public transport. Rather than being hot, bothered and tired, I’m buzzing with excitement and not a little but smug. If I had to be in an office here by 9am I’d be early and have time for a coffee before I parked up in a free motorcycle parking spot. Ride further into the city and parking is as little as a pound a day and there’s no congestion charge. Having proved a bike is the only way to commute and that the Honda is perfect tool for the job, the CBR500R carries on impressing on the ride back to MCN HQ in Peterborough. It could easily travel at three figure speeds, there’s decent wind protection, even for a six-footer and it’s roomy. It handles well at high and low speeds and it could even handle a trackday. But after a whole day riding, the seat could be comfier. We’ve done 190 miles today and there are still two bars on the fuel gauge when I fill up to check the mpg. I squeeze just 11.23 litres of unleaded in the tank. That’s 77mpg and just £12.23 to do all those miles. I reckon you could squeeze a good 230 miles out of the Honda’s tank before a flashing fuel light would panic you into topping up. The theoretic range is over 280 miles. If my A2 commute was for real I’d only have to fill up every four days, or so. That’s just three quid a day for fuel… and a big fat smile on my face everyday on the way into work. 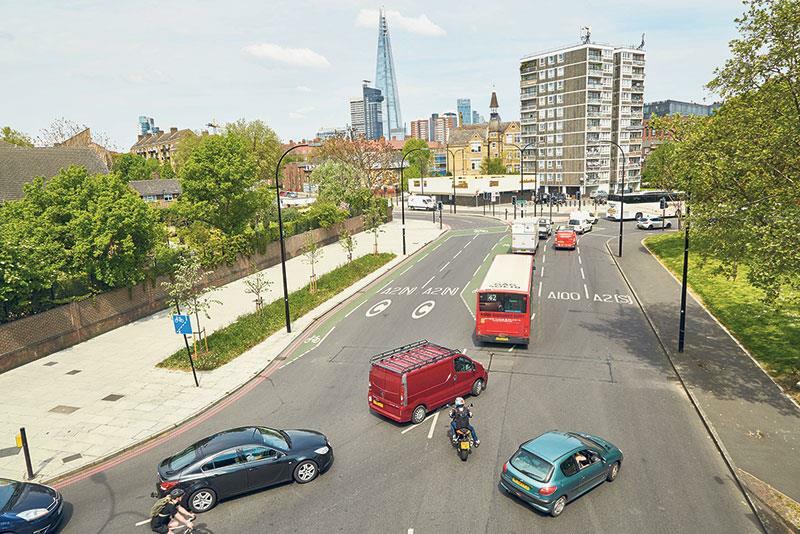 We tackled one of the busiest commutes in the UK: the A2 into south London, on the A2 licence-friendly Honda. The A2 starts in Dover and carries on through Canterbury and the Medway towns, but our route starts at Cobham, where the A2 breaks out into dual carriageway, meets the end of the M2 and heads west into London. It’s 24 miles from there to the end of the A2 at Borough underground station. Honda’s CBR500R was already a class-leader and continues to impress. Upgrades for 2016 aren’t a huge step forward, but then it wasn’t exactly broken to begin with. It’s the perfect commuting tool and a bike to have fun on at weekends, too.